As we enter the first weekend of October, here's a look around the Power Five leagues as we try to separate contenders from pretenders. WASHINGTON — If September is “Show Me” month for individual programs and teams, it’s “Crow Me” month for conferences. Leagues can dine out on their fat won-loss record in the season’s first month, as many of those games are buyouts against FCS or lower-tier FBS schools. Alabama has had two such games so far this fall, and coach Nick Saban has wondered aloud why the students haven’t been in their seats for an 11 a.m. local time kickoff with the likes of Louisiana-Lafayette. Forgive me coach, but most 18- to 22-year-olds are thinking about getting brunch in the dining hall at that time on Saturday — especially if there’s an omelet or waffle bar at their disposal. Hyphenated schools aren’t going to pull them away from Monte Cristo sandwiches. That said, the Southeastern Conference is the leader of the pack in our annual October conference call: This week we look at the Power 5 conferences, from the contenders to the underbelly. SEC: 33-5, with six of 14 schools in the AP Top 25. Contenders: No. 1 Alabama, No. 2 Georgia, No. 5 LSU and No. 8 Auburn. Kentucky’s 5-0 start, after further review, is not an accounting error and Florida has half of its wins from lower-tier schools Charleston Southern and Colorado State. Underbelly: Missouri is 3-1 and averaging more than 40 points a game? The third-best Tiger team in the league is the early surprise. Woe are the Magnolia State schools: Ole Miss and Mississippi State are a combined 0-4 in league play. Thank goodness for the Egg Bowl. Big 12: 21-7, with four of 10 schools in the Top 25. Contenders: No. 7 Oklahoma and No. 9 West Virginia are unbeaten, while No. 19 Texas continues to kick itself for the Longhorns’ loss to Maryland and No. 25 Oklahoma State continues to be embarrassed by coach Mike Gundy’s mullet. Underbelly: TCU couldn’t hold on to leads against Texas or Ohio State, while Kansas is 2-3!?! That’s like an 8-win season in Lawrence. ACC: 32-11, with four of 14 schools in the Top 25. Contenders: No. 3 Clemson needed a fourth-quarter rally to beat Syracuse at home, while No. 17 Miami got exposed by LSU Labor Day weekend. NC State (No. 23) is unbeaten, but lost a huge chance to develop street cred when their game against West Virginia was canceled by Hurricane Florence. Underbelly: While Duke and Syracuse are defying the “basketball school only” stigma with 4-1 starts, North Carolina is playing up to that stereotype at 1-3. Pac-12: 23-11, with four of 12 schools in the Top 25. Contenders: No. 10 Washington lost a tough neutral-site game to Auburn in Atlanta, while No. 21 Colorado is the league’s last remaining unbeaten. The Buffaloes will be tested with consecutive road games at USC and the Huskies. Underbelly: We knew the transformation wouldn’t be immediate under coach Chip Kelly, but I don’t think anyone thought UCLA would start 0-4 while allowing 38 points in consecutive losses to Fresno State and Colorado. Big Ten: 27-13, with five of 14 schools in the Top 25. Contenders: No. 3 Ohio State is the league’s last unbeaten after rallying to beat No. 11 Penn State in Happy Valley, but the Nittany Lions, No. 15 Michigan and No. 16 Wisconsin are each 4-1 with the path to the College Football Playoff in their hands. Does anyone think that one-loss teams like Indiana, Iowa, Maryland and Minnesota are capable of making a move? As always, the jury is out on No. 20 Michigan State. Underbelly: Rutgers (1-4) has a better record than Nebraska (0-4). Let that sink in for a while, seeing as how as there are those who will remind you how great the Cornhuskers were last century. Just like the Scarlet Knights dominated the first-ever college football game, played in 1869 (a 6-4 win against Princeton that wasn’t as close as the score indicates). 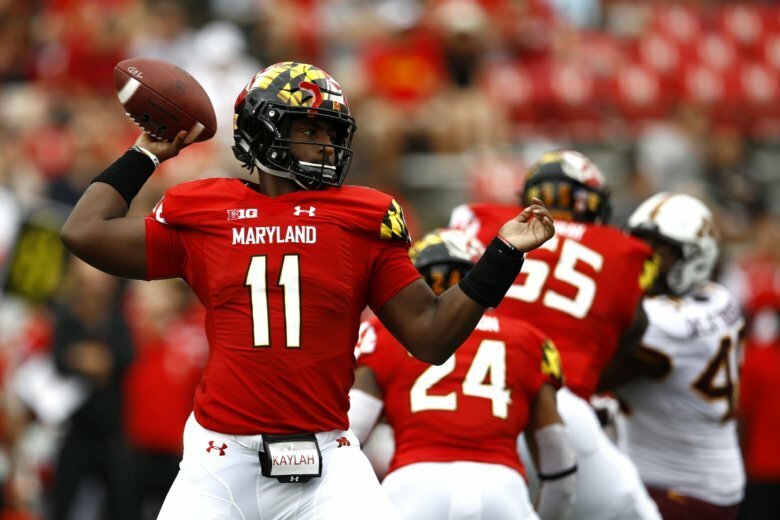 The Terps come off the bye week by going to the Big House, and they take the Big Ten’s least-productive passing game into Ann Arbor to face a Wolverines defense that ranks first in the conference against the pass and overall (they may rank third against the run in the league but are seventh overall nationally). Keep your eyes on Chase Winovich — the senior defensive lineman leads the team in sacks and is second in tackles. Maryland will go as far as its running game, and that has shown a propensity to make the big play (touchdown runs this season include scampers of 36, 64 and 81 yards) — but they’ll be minus the injured Lorenzo Harrison and his 8.4 yards per carry. When Michigan has the ball, watch out for Karan Higdon (6.3 yards per carry and 119.8 per game), it’ll be a tough test for a Terps D that leads the league in getting off the field on third down. The Mids have won just once in Colorado Springs this decade, and they needed overtime to do so in 2012. Offense is not a problem for the Falcons, who have scored 25 or more points in each of their four games. The Midshipmen have had issues stopping everybody this year, allowing 21 or more points whether their foe was FCS Lehigh; a Hawai’i team that’s off to a 5-1 start, or an SMU squad that was 0-3 when they met. Both teams can run the ball — the Midshipmen lead the nation by averaging 355 yards on the ground and the Falcons rank 11th (254.8). But Air Force also ranks 11th nationally in stopping the run, allowing 98.5 yards per game. They won’t handcuff Navy’s option, but they’ll slow the fleet of backs just enough. Which Hokies team will we get in Blacksburg Saturday — the one that went into Durham and defeated then-unbeaten Duke or the one that allowed 35 points in the second half at then-winless Old Dominion? After three one-possession games to start the season, the Fighting Irish appear to have turned the corner behind quarterback Ian Book. Pick your poison, VT defense: The junior threw for four touchdowns against Stanford one week after running for three scores at Wake Forest. It’s the second start for Ryan Willis, who will find the Catholic school’s defense a little less forgiving than the Blue Devils’. Life is amusing that way. Virginia (3-2, 1-1 ACC) is idle, but don’t you dare think Kippy and Buffy will be taking it easy this weekend. Bye weeks are for shuttering up the cottage in the Outer Banks — and there’s no better way to wave goodbye to summer than by enjoying a 2010 bottle of JM Gobillard et Fils Millesime Champagne. “Straw color, lovely aromatics (violets and strawberries), persistent perlage (meaning the bubbles are evocative of pearls), and pleasant mix of fruity and pastry-like notes.” Break out the Black Diamond Hackleback Caviar on toast points (the lighter toasted, the better). Georgetown falls at Fordham, Howard beats North Carolina Central, James Madison beats Elon, William & Mary loses to Albany, Richmond falls to Delaware, Towson shocks Stony Brook. Season: 26-14. What will “Moving Month” bring us? Ed. Note: With legal sports gambling coming soon to a state near you, we’re including two more picks this year: Chris Cichon’s “The Big Chee’s” will pick a Top 25 game each week, while Noah Frank’s “Frankie’s Flyer” will pick an underdog of at least 7 points to cover and possibly spring an outright upset.